This lithograph is taken from plate 10 of 'Afghaunistan' by Lietenant James Rattray. The area around the tomb of Mahmud of Ghazni (998-1030) Rattray thought to be one of the most pleasing spots in Afghanistan. The tomb was entered via a spacious courtyard, watered by a clear stream. Visitors would pass through covered passages to a garden framed by mulberry, plum, pear, peach, apricot, cherry and rose trees. Their blossoms hung over exquisitely carved marble tombs, including Mahmud's. 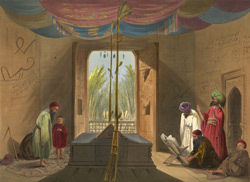 This was a place of pilgrimage, decorated with flowers and peacock feathers: Afghan symbols of royalty. The folding doors shown were reputed to be the famous Sandalwood Doors, carried off in 1026 by Mahmud after his destruction of the Somnath Temple in Gujarat, during the last of his devastatingly successful forays in India. The British removed them from the tomb in 1842, laboriously transporting them to Agra Fort, where they were found to be replicas of the original.